(NaturalNews) Eye-opening research, expert testimonial and the cold hard statistics on vaccines converge in a groundbreaking new book: Vaccination Voodoo: What YOU Don't Know About Vaccines. Author Catherine J. Frompovich lights the way as she breaks down each chemical used in today's vaccines, explaining the specific influence that the additives have on the human body. Joined by Mayer Eisenstein, MD, JD, MPH, and Paul G. King, PhD, Frompovich yanks the mask off of Big Pharma's fake face, exposing the propaganda that is dished out through the media while shining a light on the misinformation sold to medical journals and medical professionals. 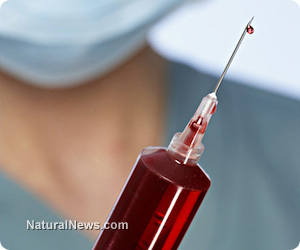 The author delves right into the debate, discussing the dangers of injecting heavy metals directly into the blood and tissues, how these metals can pass through the blood-brain barrier and how toxicity can ultimately impart damage to the neurological system. She confronts the use of adjuvants, the immune system stimulants in vaccines, for their destructive ability to cause hyper-allergenic reactions and the autoimmune destruction of brain cells. Thimerosal, which is 49.6% ethylmercury, is scolded, while toxic ingredients like aluminum, 2-phenoxyethanol, formaldehyde/formalin, polysorbate 80, phenol, glutaraldehyde, MSG and sodium borate are exposed. She writes about other hidden ingredients in the injections, like monkey kidney cells, genetically engineered insect viruses and diploid cells, which are aborted human fetal tissue. She wastes no time calling out Big Pharma for their hand in causing multiple thousands of death each year, and debilitating complications caused by controversial vaccines like Prevnar or HPV Gardasil strains that were sold to people as preventive healthcare. Swine flu vaccines, mass produced to expel H1N1 flu strains, are also confronted as a health fraud, responsible for bringing mass waves of narcolepsy to young adults. Her investigations show how many vaccine manufacturers own their own science journals that solicit authors to publish pieces that promote Big Pharma's products. Many times, pharmaceutical companies have paid staff writers who peddle vaccines down the medical profession line. The companies may pay off, or sell to medical doctors a bunch of propaganda that can be published as the doctor's own medical research. The book is up front about the "get out of jail free card" given to vaccine manufacturers. Through the passage of the 1986 National Childhood Vaccine Injury Act, Congress protected vaccine manufactures from ever being brought before a jury of their peers. Thanks to this law, vaccine injury claims are lumped together and often dismissed as trial cases with no credentials. Now insulated from judicial accountability, pharmaceutical companies have gone all out selling their side effect-ridden concoctions, promoting new experimental vaccines each year, which are now jabbed into children by the dozens here in the 21st century. This book helps everyone understand what's in vaccines, including various excipients, adjuvants, metals, growth media and nanoparticles, and how these unnatural substances affect cellular function. The books helps people rethink about vaccine admission requirements dictated to kindergartens and elementary schools, showing how increased childhood vaccination has manifested a disturbing trend in autism in which 1 in 50 children are now affected. The books puts out statistics about the 60-plus vaccines rammed down children today, a number that is three times greater than figures from 1970, and about how this accumulated toxicity has created a generation of children sicker than decades ago. Then pick up a copy of the new book here: Vaccination Voodoo: What YOU Don't Know About Vaccines.